This was taken on the way to the Stirling Range. Since then we stopped at the micro town of Borden and met a very helpful fellow traveller called Alan and his pet chihuahua Kira in a very fine custom made ’85 kombi. On the other hand we have seen and met dozens of Harley Davidson riders on their way back from a 1000 strong Rally in Margaret River. One thing they all have in common is the genuine friendliness of Australians. We took another detour yesterday to Bremer Bay to capture some stock shots and bumped in to a group of professional photographers called 90 degrees 5 shooting the same beaches. After quizzing them about how survive as a Photographer in Australia we headed back inland to Ravensthorpe. The landscapes in Australia are full of colour. Even the roadside offers many possibilities of Red, Green and Blue. 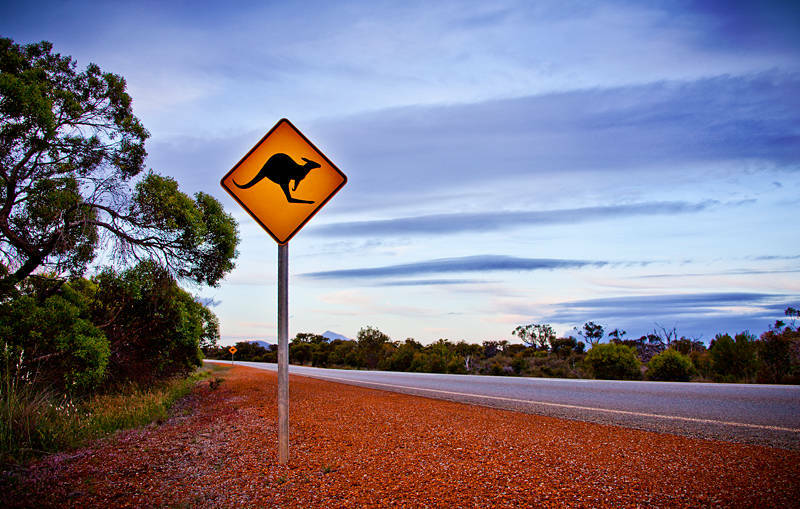 These signs warning of Kangaroo, Emu, Wombat, Camel and some which I have yet to identify are all over the highways. The only thing we have hit so far are countless insects. We saw our first Emu and Snake yesterday but each encounter was too brief to capture. We are looking forward to arriving in Esperance on Thursday. This image was accepted for Stock Photography at Shutterstock and is available for download here. Hi. We can’t get further back than your blue wren. Maybe there is a missing link? If only the BBC had seen this picture first….. Fixed missing link. Should be fine now.